Ta-Nehisi Coates has written brilliantly about the dangers to black bodies of police murder in Between the World and Me. His words give the deepest sense of why Black Lives Matter is the most important movement from below of our time (many chicanos are also part of this). Led by young black women, this movement from the bottom up has exposed racist police shootings and brought to life on campuses from Missouri to Princeton, challenges to the fundamental racism on campus. Black Lives Matter intends to lift the long heritage of racism, for example, for the Klan-loving, lynching advocate, resegregating the civil service Woodrow Wilson. See here. In Denver, Black Lives Matter 5280 transformed the large Marade, in the spirit of Martin Luther King, into a protest against city racism, not just a celebration of corporate donors (the State Farm martin luther king day – what it has been). See here and here. Coates also took on Bernie Sanders’ rejection of reparations (similar to Obama’s and Hillary Clinton’s). This was in the context of the New York Times‘s continuing campaigning for Hillary, even in its “reporting” and inviting every op-ed writer – Paul Krugman and David Brooks the silliest – to back Hillary’s campaign to “get things done,” i.e. less than Obama. Where Bernie speaks forthrightly to ordinary people as Nina Turner, Killer Mike, Cornell West and many others have underlined, Hillary is herself, so to speak, a large corporation – she is not bought off venally; it is who she has chosen to be or hang out with in her long career. She does not generally reach out or listen to ordinary people even on her listening tour in Iowa (she is, commendably, campaigning with Geneva Reed-Veal, Sandra Bland’s mother, in Chicago next week but she listens to and what she proposes is sharply curbed by the elite…). In “The Enduring Solidarity of Whiteness” from the Atlanticbelow, Coates makes the important point that black suffering and oppression is much worse than white (and worse also than Chicano – it is of course second to that of indigenous people…). He takes apart the sometimes foolish argument of Cedric Johnson. In addition, Ta-Nehisi has suggested rightly that Bernie Sanders is not on top of the abyss between how blacks are treated in this society and even poor whites. Sanders does get the enormous oppression of blacks (cf. Killer Mike’s remarks in Atlanta), has taken on a spokesperson from Black Lives Matter, and is reaching out to young people and others sympathetic to this movement (it is one of the best features of the campaign that he has forced Hillary Clinton to try to recruit black voters by saying some important truths about racism, as in the debate last night). The way Karl Marx got this, in theoretical and political/strategic terms, is worth taking in, is “labor cannot be free in the white skin where in the black it is branded.”(see the last page of ch. 10 of volume 1 of Capitalon “The Working Day”). Poor whites in the North and South could not be free if blacks were enslaved. Whatever allegiance some whites show to racists, most ordinary people have no interest in racism, no moral interest – if you are a racist, you become a monster – and no economic and political/democratic interest. As Marx suggested, with the death of slavery, a new movement for the 8 hour day, lasting 30 years emerged. The Haymarket massacre – the police threw a bomb at a big demonstration in Chicago – and lynching of 4 anarchist organizers (including Albert Parsons, the white husband of the great black abolitionist Lucy Parsons) was a temporary defeat for the movement, but one that underlines the importance of multiracial unity, anti-racist solidarity in eventually winning the goal (and the Second International of socialist parties made the struggle for a normal working day of 8 hours worldwide, based on this American movement). In 1984, Michael Reich, an economist at Berkeley, published the magnificent, still unrefuted though ignored by social “scientists” who are sorely afflicted by racism, Racial Inequality: a Political-Economic Analysis at Princeton University Press (the leading academic press). He showed for every “standard metropolitan statistical area” in the United States, where black workers have the worst incomes and social services, there white workers also have relatively the worst (among whites), and the income differential between most people and the top 1% is at its greatest. Divide and rule is, politically and economically, the name of capitalism. Now Bernie agrees with this point in formulating the democratic coming together of a political revolution against the billionaire class (he could follow King more in seeing the need for mass militant nonviolent protest…; surely, however, a political revolution through the ballot would be better. and if this movement from below is stopped by the elite/Clinton, there will be mass militant resistance…). His words are refreshing, often moving, and true. But Bernie does not quite see that fighting racism is the secret of class unity, of benefiting everyone, and that no movement which obscures or fails to take up fighting racism as its fundamental purpose can actually be a good class movement. So even though he makes many points in favor of black workers – a $15 minimum wage rather than Hillary’s tone-deaf “$12 over 5 years – he does not speak sharply enough – across the board – to the interconnection of these issues. He would do better, including as a debater (he is, nonetheless, very good), if he figured this out. Nonetheless, as Coates too will cast his vote, Bernie’s election would make a big difference. He is the only candidate who listens to black protestors, notably the two women who shut down a speech of his – and responds vigorously and graciously. But Ta-Nehisi’s point, that Bernie does not spell out enough – except on the issue of mass incarceration – the depth of racism is true. Bernie’s “class” analysis is not quite right. Yet, Ta-Nehisi also overestimates – understandably but mistakenly, and to negative political effect – “the enduring solidarity of whiteness.” At Selma, as we saw again in the Ada Duvernay’s wonderful movie about King, when the marchers were viciously attacked on the Edmund Pettus Bridge, many whites came to march with blacks from the North. See here. Reverend Jonathan Daniels, too, was murdered there by the Klan (as my friend Andy Goodman was murdered in Philadelphia, Mississippi along with James Chaney and Mickey Schwerner). At Yale and Princeton, many white students have joined black protests against racism. Many whites now abhor the shooting of innocents which is characteristic of American police misconduct (in contrast to other countries – see here and here). That “whiteness” is disgusting is true (look at the Southern “picnics” organized by the elite at lynchings, and the great work of Bryan Stephenson and the Equal Justice Initiative and what it means to be or make monsters – as racists are and attempt to do with their children – will come home to you fully. But these very women started Black Lives Matter with all its immense consequences in solidarity and accomplishment – including its real support even in the white community. It is time to see clearly – all of us – why the destructive way capitalism works makes democratic solidarity from below the only answer. And one aspect of that solidarity is to be part of a movement to elect Bernie Sanders, to make as the two protestors did at Bernie’s rally an understanding of racism central in and outside of it, and to fight for as many of Bernie’s proposals as we can. At various points in my life, I have subscribed to some version of Johnson’s argument. I did not always believe in reparations. In the past, I generally thought that the problem of white supremacy could be dealt through the sort of broad economic policy favored by Johnson and his candidate of choice. But eventually, I came to believe that white supremacy was a force in and of itself, a vector often intersecting with class, but also operating independent of it. Nevertheless, my basic feelings about the kind of America in which I want to live have not changed. I think a world with equal access to safe, quality, and affordable education; with the right to health care; with strong restrictions on massive wealth accumulation; with guaranteed childcare; and with access to the full gamut of birth-control, including abortion, is a better world. But I do not believe that if this world were realized, the problem of white supremacy would dissipate, anymore than I believe that if reparations were realized, the problems of economic inequality would dissipate. In either case, the notion that one solution is the answer to the other problem is not serious policy. It is a palliative. Coates’s sweeping mischaracterization diminishes the actual impact that social-democratic and socialist governments have historically had in improving the labor conditions and daily lives of working people, in Europe, the United States, and for a time, across parts of the Third World. There is not a single word in this response relating to race and racism in Western Europe or anything remotely closely to it. Instead, Johnson proposes to bait with race, and then switch to class. He swaps “labor conditions and daily lives of working people” in for “victims of white supremacy” and prays that the reader does not notice. Indeed, one might just as easily note that the advance of indoor plumbing, germ theory, and electricity have improved “the labor conditions and daily lives of working people,” and this would be no closer to actual engagement. This pattern—strident rhetoric divorced from knowable fact—marks Johnson’s argument. Reparations, he tells us, do not emerge from the “felt needs of the majority of blacks,” a claim that is hard to square with the fact that a majority of blacks support reparations. 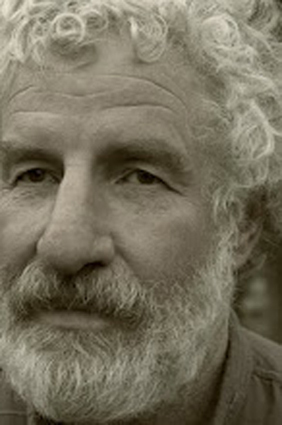 Instead, he argues, the claim for reparations emerges from a cabal of “anti-racist liberals” and “black elites” seeking to make a “territorial-identitarian claim for power.” In fact, the reparations movement runs the gamut from the victims of Jon Burge, to those targeted by North Carolina’s eugenics campaign, to those targeted by the same campaign in Virginia, to those targeted by “Massive Resistance” in the same state, to the descendants of those devastated by the Tulsa pogrom. Are the black people of Tulsa who suffered aerial bombing at the hands of their own government“black elites” in pursuit of “territorial-identitarian claim?” Or are they something far simpler—people who were robbed and believe they deserve to be compensated? Johnson denigrates recompense by asserting that the demands for reparations have not “yielded one tangible improvement in the lives of the majority of African Americans.” This is also true of single-payer health care, calls to break up big banks, free public universities, and any other leftist policy that has yet to come to pass. For a program to have effect, it has to actually be put in effect. Why would reparations be any different? But ultimately, Johnson doesn’t reject reparations because he doesn’t think they would work, but because he doesn’t believe specific black injury through racism actually exists. He favors a “more Marxist class-oriented analysis” over the notion of treating “black poverty as fundamentally distinct from white poverty.” Johnson declines to actually investigate this position and furnish evidence—even though such evidence is not really hard to find. Courtesy of Emily Badger, this is a chart of concentrated poverty in America—that is to say families which are both individually poor and live in poor neighborhoods. Whereas individual poverty deprives one of the ability to furnish basic needs, concentrated poverty extends out from the wallet out to the surrounding institutions—the schools, the street, the community center, the policing. If individual poverty in America is hunger, neighborhood poverty is a famine. 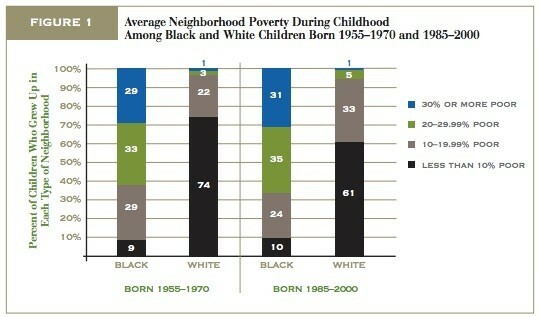 As the chart demonstrates, the black poor are considerably more subject to famine than the white poor. Indeed, so broad is this particular famine that its reach extends out to environs that most would consider well-nourished. In its pervasiveness, concentration, and reach across class lines, black poverty proves itself to be “fundamentally distinct” from white poverty. It would be much more convenient for everyone on the left if this were not true—that is to say if neighborhood poverty, if systemic poverty, menaced all communities equally. In such a world, one would only need to craft universalist solutions for universal problems. 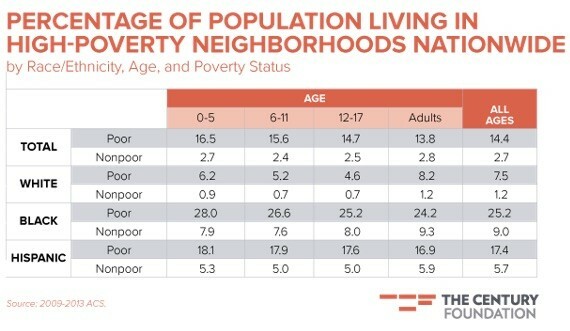 Neighborhood poverty alone, accounts for a greater portion of the black-white downward mobility gap than the effects of parental education, occupation, labor force participation, and a range of other family characteristics combined. No student of the history of American housing policy will be shocked by this. Concentrated poverty is the clear, and to some extent intentional, result of the segregationist housing policy that dominated America through much of the 20th century. But the “fundamental differences” between black communities and white communities do not end with poverty or social mobility. 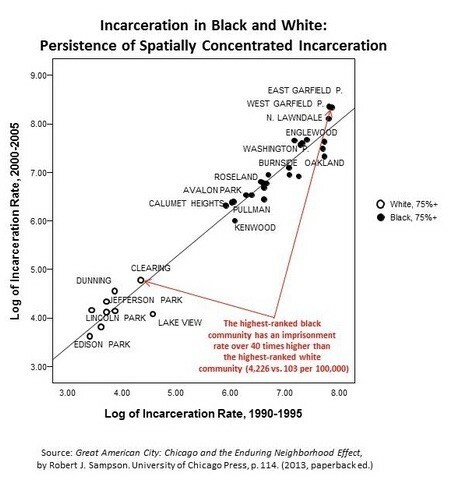 In the chart above, Sampson plotted the the incarceration rate in Chicago from the onset imprisonment boom to its height. As Sampson notes, the incarceration rate in the most afflicted black neighborhood is 40 times worse than the incarceration rate in the most afflicted white neighborhood. 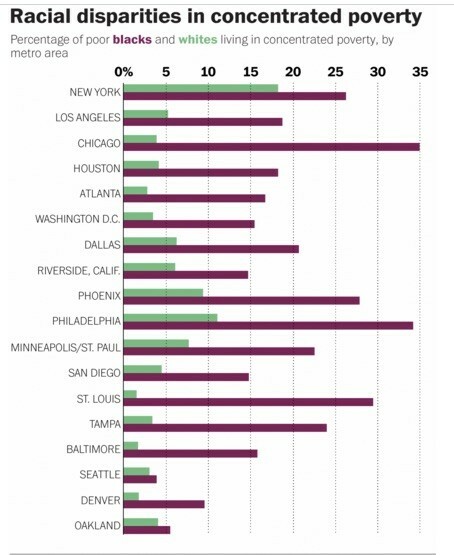 But more tellingly for our purposes, incarceration rates for white neighborhoods bunch at the lower end, while incarceration rates for black neighborhoods bunch at the higher end. There is no gradation, nor overlap between the two. It is almost as if, from the perspective of mass incarceration, black and white people—regardless of neighborhood—inhabit two “fundamentally distinct”worlds. The pervasive and distinctive effects of racism are viewable at every level of education from high school drop-outs (see pages 13-14 of this Pew report, especially) to Ivy league graduates. I strongly suspect that if one were to investigate public-health outcomes, exposure to pollution, quality of public education or any other vector relating to socio-economic health, a similar pattern would emerge. I am not opposed to solidarity, in and of itself, but I would have its basis made clear. When an argument is divorced of this clarity, then deflection, subject-changing, abstraction, and head-fakes—as when Johnson exchanges“laborers” for the victims of white supremacy—all become inevitable. …Coates’s latest attack on Sanders, and willingness to join the chorus of red-baiters, has convinced me that his particular brand of antiracism does more political harm than good, further mystifying the actual forces at play and the real battle lines that divide our world. The feeling is not mutual. I think Johnson’s ideas originate not in some diabolical plot, but in an honest and deeply held concern for the plundered peoples of the world. 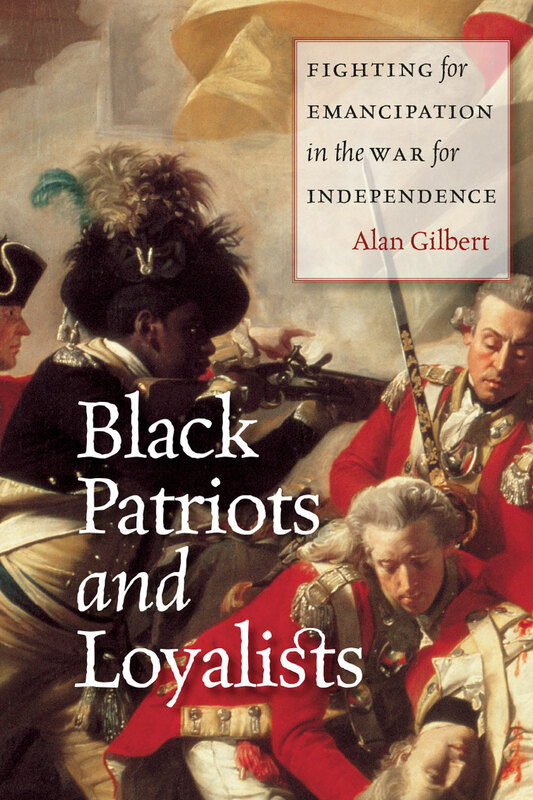 Whatever their origin, there is much in Johnson’s response worthy of study, and much more which all who hope for struggle across the manufactured line of race might learn from. Johnson’s distillation of the Readjuster movement, his emphasis on the value of the postal service and public-sector jobs, and his insistence on telling a broader story of housing and segregation add considerable value to the present conversation. His insistence that airing arguments to the contrary is harmful does not. Acclaimed writer Ta-Nehisi Coates made headlines this week when he said on Democracy Now! that he would be voting for Democratic presidential candidate Bernie Sanders. Coates had previously penned a widely read article criticizing the Vermont senator for saying he did not support reparations for slavery because it was too “divisive” an issue. But on Wednesday, Coates said he is voting for Senator Sanders anyway. After his appearance was picked up by news outlets, from CNN, MSNBC and BBC to The New York Times, Ta-Nehisi Coates published a follow-up for The Atlantic titled “Against Endorsements,” writing that his “answer has been characterized, in various places, as an ‘endorsement,’ a characterization that I’d object to. Despite my very obvious political biases, I’ve never felt it was really my job to get people to agree with me.” In Part 2 of our conversation with Coates, whose book “Between the World and Me” won the National Book Award, Coates elaborates on who he would like to see elected, and much more. “If I could have anything—you know, and this is across the board for any presidential candidate—I would have a greater acknowledgment of history in our policy and in our affairs,” Coates says. He also discusses the Black Lives Matter movement, Bill Cosby and the growing number of actors and filmmakers pushing for a boycott of the Oscars after no actors of color were nominated for a second year in a row. AMY GOODMAN: The acclaimed writer Ta-Nehisi Coates made headlines this week on Democracy Now! in newspapers around the world and on networks, when he said he’d be voting for Democratic presidential candidate Bernie Sanders. Coates had previously penned a widely read article criticizing the Vermont senator for saying he did not support reparations for slavery because it was too “divisive” an issue. But on Wednesday, Ta-Nehisi Coates told me he’s voting for Senator Sanders anyway. TA-NEHISI COATES: One can say Senator Sanders should have more explicit antiracist policy within his racial justice platform, not just more general stuff, and still cast a vote for Senator Sanders and still feel that Senator Sanders is the best option that we have in the race. But just because that’s who you’re going to vote for doesn’t mean you then have to agree with everything they say. AMY GOODMAN: Will you be voting for Senator Sanders? TA-NEHISI COATES: I will be voting for Senator Sanders. I have tried to avoid this question, but, yes, I will be voting for Senator Sanders. I try to avoid that, because I want to write as a journalist—do you know what I mean?—and separate that from my role as, I don’t know, a private citizen. But I don’t think much is accomplished by ducking the question. Yes, I will vote for Senator Sanders. My son influenced me. AMY GOODMAN: After Ta-Nehisi Coates’s appearance on Democracy Now! was picked up by news outlets, from CNN to MSNBC, to BBC, to The New York Times, to The Washington Post and The Baltimore Sun and many other outlets, Ta-Nehisi Coates published a follow-up for The Atlantic titled “Against Endorsements.” He wrote he answered my question about his decision to vote for Sanders because, quote, “I’ve spent my career trying to get people to answer uncomfortable questions. Indeed, the entire reason I was on the show was to try to push liberals into directly addressing an uncomfortable issue that threatens their coalition. It seemed wrong, somehow, to ask others to step into their uncomfortable space and not do so myself,” he wrote. Ta-Nehisi Coates also wrote, quote, “My answer has been characterized, in various places, as an ‘endorsement,’ a characterization that I’d object to. Despite my very obvious political biases, I’ve never felt it was really my job to get people to agree with me,” he said. We turn now to Part 2 of my conversation with Ta-Nehisi Coates, whose book Between the World and Me won the National Book Award. He recently moved to Paris with his wife and his son Samori. In Part 2 of our conversation, I asked Ta-Nehisi what it’s like to live in France. TA-NEHISI COATES: You know, to be honest, I have to tell you, the biggest influence that it’s had on me, I mean, just in terms of what we talked about in terms of Senator Sanders, to be in a country which has much greater social protections than we have here, a much stronger safety net than we have here, and to meet with black people over there, to meet with, you know, Maghrébin people over there, and to see that even with all of those—you know, that expansive safety net that they have that’s so much stronger than ours, it hasn’t cured racism. You know? Not only has it not cured racism, in many ways, you know, folks are struggling with the vocabulary of how to talk about it. You know, maybe curing racism is too high of a bar. But to see that it actually remains an issue, that the idea of identity across Western Europe—in fact, not just in France, across Western Europe, in Germany, because, you know, when you see these sort of issues with the, quote-unquote, “refugee crisis” and everything, it’s actually the same thing. It’s very, very much the same thing—a continent that is becoming browner and struggling with the idea of who’s going to actually be protected by these safety nets. I’m really early in the process of learning about this. But it’s very, very clear that the United States is not necessarily different, you know, in terms of the issues it’s dealing with. AMY GOODMAN: —the state of emergency that was imposed, no protests and everything. And then immediately the authorities started raiding homes, businesses, mosques, thousands of them. The treatment of the Arab community in France? TA-NEHISI COATES: It is brazen. You know, it’s tremendously, tremendously brazen. The minister of justice over there, Christine Taubira, just resigned because they are passing a law to strip you of your citizenship, you know, should you be convicted of a terrorist act. It is—you know, one of the cases I tried to make in the book was this notion that—you know, the idea that racism necessarily follows from race is in fact backwards—people decide to do something, there’s a relationship that exists, and then people are cast in a certain way. And I have to tell you, you know, again, just being at the beginnings of seeing this, just being at the start of experiencing it, I really feel like I can see it there. You know, France has a particular relationship with its colonies—its past colonies. It has a particular relationship with Algeria. It has a particular relationship with West Africa. And that casts so much about how folks see each other. You know, so when I’m somewhere and I speak in my horrible French accent, you know, which automatically signals I’m an American, you know, the reaction is very, very different. You know, the way I’m treated is very, very different. What I’m saying is it’s a result of a system that’s already in place, beliefs that are there. It’s not just a matter of looking at somebody and deciding you don’t like them. AMY GOODMAN: The recommendation on your book is by Toni Morrison: If you’re going to read one book, read this. And she talks about the hole that was left when James Baldwin died, and she feels that has now been filled by you, Ta-Nehisi. And, of course, James Baldwin also went to France. What is it about France? TA-NEHISI COATES: You know, I have no idea. That’s the one—you know, I can speak about how Baldwin influenced me in terms of just his bravery, his courage, you know, in terms of him really being willing to go out on the edge, you know, the ledge, in terms of his political imagination. I can speak about him as a beautiful, beautiful writer and a beautiful craftsman of sentences. But in terms of France, it’s very, very hard. And I think it’s because I went through a different route. You know, I went through a more family route. My wife fell in love with the country, really wanted the family to spend more time there. And so, it wasn’t, in that sense—you know, certainly in Between the World and Me, but in that specific sense, I wasn’t so much chasing Baldwin; however, you know, I may have a different answer in 10 years, because maybe there’s something about that that’s working on a larger level. I just—I don’t particularly see it right now. AMY GOODMAN: One of the classic images just in the last 24 hours, you had Chris Christie at a town hall in New Hampshire, and they actually play a clip of this. It’s not usually substance; it’s all polls. And a woman says, “I don’t know who I’m going to vote for. I’d like to vote for you. But I need to know what you’re going to do about Social Security.” And he gets down on his knee to beg her to vote. AMY GOODMAN: So, at the point where he gets down on his knee to say, “Please, I want your vote,” before he answers the question, that’s when they cut away. And they don’t talk about his answer to what he’s going to do about Social Security. AMY GOODMAN: They talk about the kneeling part. AMY GOODMAN: —of what these people actually stand for. AMY GOODMAN: But you have—so, how do you absorb what’s happening there? TA-NEHISI COATES: Well, in some respects, what it makes you realize is how little actual information is being conveyed, because, you’re right, you know, I don’t have the same sort of inundation anymore. And I think maybe I’m a better person for it. You know, just being able to look away for a little while, I think, has been really, really, really good. I am not surprised that, you know, you ultimately don’t get the content answer in that situation. But for me, for my own personal health, I think following this—I went through this in ’08 a little too closely—too much can actually be unhealthy. So I’m happy to have something else to do. AMY GOODMAN: —Black and Brown Presidential Forum last month, when they were asked about reparations. AMY GOODMAN: She was asked by an audience member about what the term “white privilege” meant to her. HILLARY CLINTON: It is hard when you’re swimming in the ocean to know exactly what’s happening around you, so much as it is when you’re standing on the shore perhaps watching. For me, you know, look, I was born white, middle-class in the middle of America. I went to good public schools. I had a very strong supportive family. I had a lot of great experiences growing up. I went to a wonderful college. I went to law school. I never really knew what was or wasn’t part of the privilege. I just knew that I was a lucky person and that being lucky was in part related to who I am, where I’m from and the opportunities I had. AMY GOODMAN: Your response, Ta-Nehisi, to what Hillary Clinton said? TA-NEHISI COATES: That’s about right. That’s about right. I think she was trying her best there. I think what is notably absent from that answer is history. It is not simply that Hillary Clinton had fairer skin and, you know, lighter hair, and therefore certain things were conferred upon her. Systems were in place. Long, ancient historical systems were in place to make her, as she said, lucky in the first place. If I could have anything—you know, and this is across the board for any presidential candidate—I would have a greater acknowledgment of history in our policy and in our affairs. And I don’t mean, you know, a dry historical lecture. But it could have taken 30 seconds for her to maybe explain why she was a little luckier than other folks. It’s not that hard to understand. It’s not that hard to know. I’m not familiar particularly with Hillary Clinton’s neighborhood, but I wish people were a little bit more curious about what we call privilege and about why it’s there. Black people in this country have no choice but to be curious. We have to know. I wish folks would do a little bit more investigation. AMY GOODMAN: —as they’ve interrupted forum, demanded answers from presidential candidates. They’re really helping to shape this debate. TA-NEHISI COATES: Well, they are. They are. I mean, you know, if you want tangible evidence of that, New York City, where we live, you know, for whatever you think of this, has decided to change certain policies in terms of how it records officer encounters and violence that officers inflict on people. That’s a real thing that’s actually happened. This debate about body cameras, you know, would not be up there. There’s this push to have greater funding. That’s a direct result of the kind of attention that Black Lives Matter has brought to the issue. So they’ve had a literal tangible policy impact across the board. And, you know, I have to say, even my position on Senator Sanders in terms of reparations, they saw some things before I saw them. You know, I think—I didn’t write this, you know, and I wouldn’t have written this, but like a lot of other people, when I saw the interrupting of his platform, I didn’t quite get it, I didn’t quite understand it. And it was only in the course of, you know, working on the stuff that I’ve worked on in the past few weeks related to Senator Sanders that I came to understand in greater detail their frustrations. AMY GOODMAN: Were you surprised by the pushback that you got after writing this piece? TA-NEHISI COATES: Yeah, a little bit. A little bit, I was. But it’s been a great opportunity, you know? I have been extremely, extremely fortunate, in the sense that I feel like I’ve been saying the same sort of caliber of things for the past 10, 15 years now, but I have been lucky enough to get a platform at The Atlantic that makes people pay attention to things that, were I writing in other well-respected platforms that may be a little to the left, the same amount of attention would not be granted. And so, yeah, I was a little surprised, but I plan to take as much advantage of it as I can to push this conversation about racism and white supremacy as close as I can to the forefront. That’s why I’m here. AMY GOODMAN: “Even victims of discrimination can look away from—and thereby enable—other forms of violence.” Lay out your article for us. TA-NEHISI COATES: Well, I mean, we’ve seen numerous celebrities, African-American celebrities, and to some extent, you know, a relatively large amount of people within the African-American community who automatically disbelieve this. And what folks will tell you is there is a long history of American forces conspiring against African Americans, and that’s certainly true. You know, you can look at the history of Paul Robeson, Martin Luther King, Malcolm X, whoever. Nevertheless, nevertheless, you know, that can’t be an explanation for not applying one’s critical faculties. And racism is not the sole power vector at work in the United States of America, just like, you know, as I was making the case with Senator Sanders, class is not the sole power vector at work in the United States of America. And so, when you have over 40, 50 women coming forth, a lot of them with stories that are remarkably similar about what happens to them, it takes some sort of—I don’t—particular mindset to say, “Oh, no, all of them are lying. All of them are in conspiracy.” And I think that is related directly to that other power vector of sexism, which has historically been very, very, very strong. You know? And so I think that that can’t be ignored. And the fact that somebody has a boot on your neck, the fact that you, too, are a member of an oppressed class, does not mean that you, too, can’t, in some sense, cooperate with the oppression of other people. AMY GOODMAN: And, of course, many of the women are African-American. TA-NEHISI COATES: And that’s true. And that’s true. That’s exactly true, yes. AMY GOODMAN: And finally, looking at this country from your perch in Paris right now, but also being here, the whole issue of the Oscars that are coming up, the Academy Awards, a growing number of actors and filmmakers pushing for a boycott of the Oscars after no actors of color were nominated for a second year in a row—in no category—supporting actress/actor, best actor/actress and director—was there an African American named. While movies about African Americans, like Straight Outta Compton and Creed, received nominations, they went to the white writers of Straight Outta Compton and white actor Sylvester Stallone for Creed. The African-American directors and nonwhite actors were excluded. Director Spike Lee, actress Jada Pinkett Smith, actor Will Smith—who actually starred in Concussion, was not given an Oscar nod—and others have said they plan to skip the Oscars. Last month, Spike Lee appeared on Good Morning America. SPIKE LEE: I have never used the word “boycott.” All I said was my wife, my beautiful wife Tonya, we’re not coming. That’s it. Then I gave the reasons. So I’ve never used the word “boycott.” I never have said to anybody—it’s like, do you. We’re not coming, not going. This whole Academy thing is a misdirection play. SPIKE LEE: We’re chasing the guy down the field; he doesn’t even have the ball. The other guy is high-stepping in the end zone. So, this goes—it goes further than the Academy Awards. It has to go back to the gatekeepers. SPIKE LEE: Yes, the people who have the greenlight vote. Have you seen Hamilton yet? GEORGE STEPHANOPOULOS: I have seen Hamilton. Unbelievable. SPIKE LEE: You know the song, “You’ve Got to Be in the Room”? SPIKE LEE: We’re not in the room. We are not in the room. The executives, when they have these greenlight meetings, quarterly, where they look at the scripts, they look at who’s in it, and they decide what we’re making, what we’re not making. GEORGE STEPHANOPOULOS: How about your own experience? You get—you make your movies. Do you feel like you’ve been snubbed, like you haven’t had a fair hearing? SPIKE LEE: What won best film 1989? GEORGE STEPHANOPOULOS: I don’t know, actually. SPIKE LEE: Driving Miss F-in’ Daisy. GEORGE STEPHANOPOULOS: And which film did you have in 1989? SPIKE LEE: Do the Right Thing. That film is being taught in colleges, schools, all—no one’s watching this Driving Miss Daisy now. So it also shows you that the work is what’s important, because that’s the stuff that’s going to stand for years, not an award, not whether it be a Grammy, a Tony or whatnot. GEORGE STEPHANOPOULOS: So, even if you don’t get the Oscar, there is some success, but there’s still a huge problem in the whole studio system. SPIKE LEE: From top to bottom. AMY GOODMAN: That was Spike Lee being interviewed by George Stephanopoulos on ABC. We were at Sundance. We interviewed Dawn Porter, the documentarian, Stanley Nelson; they’re both supporting a boycott. Spike Lee’s just not going. Your response to all of this? TA-NEHISI COATES: [inaudible] actually, there’s a lot of wisdom in all of that. You know, I—this is personal; this is not, you know, a grand political statement. I appreciate the not using the terminology “boycott” and going for the “Listen, do you. I’m staying home. Just out of, you know, personal pride, I’m just going to stay home. I just don’t have to stand for that.” And I think he’s exactly right, because what he was pointing to, when he was talking about being in the room, was systemic issues. In other words, by the time you get to an—and, you know, you begin to see formulas across the whole—the entire system in terms of racism. And one of the things is, people shout, and everybody gets upset by the time you get to the end result, which in this case is the Oscars. But what Spike is saying is there’s like five other things that happen before that.